Industry Experts, Inc. introduced a global market research report on Phase Change Materials (PCMs). As per this new report entitles “Phase Change Materials – A Global Market Overview“, Bio-based PCMs projected the fastest growing material type between the period 2018 and 2023 while Organic are estimated the largest consumed PCMs. Phase change materials (PCMs) employ the latent heat of phase change for controlling temperatures within a specific range. These materials are environmentally responsive, implying that they respond to an environmental trigger that causes a physical change in them. These triggers can be pH, temperature or ionic concentration. Temperature is one example of a reliable trigger for controlling materials used on the body, since the physiological temperature is rather stable, i.e. around 37oC, and differs quite a lot from room temperature that is around 20oC. PCMs absorb, store and release latent heat without any change in their own temperature by moving from one physical state to another. PCMs are finding increasing use in logistics & cold chains, buildings, textiles and electronic applications, which are driving demand for these unique solutions. Temperature controlled packaging based on PCMs is used for transporting life-saving drugs and pharmaceuticals and perishable foods. These materials enable in maintaining the required temperatures within refrigerated trucks and containers. Electronic applications of PCMs are poised to post the second-fastest growth over the analysis period, which can be attributed to rapidly progressing technology leading to increasing power and speed of electronic devices, which, in turn, need better solutions for thermal management. The report analyzes the market for phase change material types comprise Bio-Based, Inorganic and Organic. 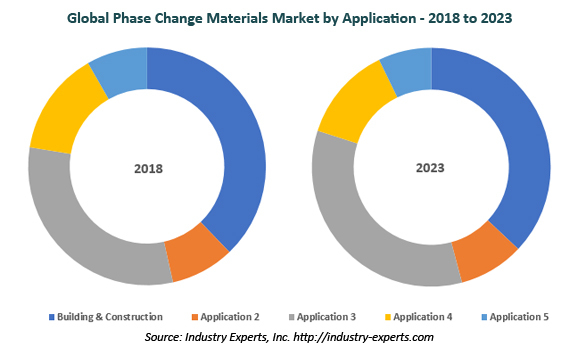 The market for major applications of phase change materials explored in this report comprise Building & Construction, Electronics, Logistics & Cold Chains, Textiles and Others (including automotive and medical). North America is the fastest growing PCM market and by material, Bio-Based PCMs will outstrip Organic and Inorganic PCMs in regard to growth. The benefits offered by Bio-Based PCMs include congruent melting and cooling, high latent heat of fusion, low cost, fire resistance, non-toxicity, minimal sub-cooling and volume change and good chemical and thermal stability even after a large number of thermal cycles. The report reviews, analyses and projects the PCMs market for global and the regional markets including North America, Europe, Asia-Pacific, South America and Rest of World for the period 2014-2023 in terms of value in USD. The regional markets further analyzed for 15 independent countries across North America – United States, Canada and Mexico; Europe – France, Germany, Italy, Russia, Spain and United Kingdom; Asia-Pacific – China, India, Japan and South Korea; and South America – Argentina and Brazil. This 342 page global market report on Phase Change Materials includes 217 charts (includes a data table and graphical representation for each table), supported with meaningful and easy to understand graphical presentation, of the market numbers. The report covers the brief business profiles of 26 key global players and 38 major market players across North America – 15; Europe – 18; Asia-Pacific – 4 and Rest of World – 1. The report also provides the listing of the companies engaged in research and development, manufacturing, supply and distribution of PCMs. The global list of companies covers the address, contact numbers and the website addresses of 49 companies.